The company was first established in 2007 as 10gen. Based in New York City, 10gen was founded by former DoubleClick founder and CTO Dwight Merriman and former DoubleClick CEO and Gilt Groupe founder Kevin P. Ryan with former Doubleclick engineer and ShopWiki founder and CTO Eliot Horowitz and received $81 million in venture capital funding from Flybridge Capital Partners, In-Q-Tel, Intel Capital, New Enterprise Associates (NEA), Red Hat, Sequoia Capital, and Union Square Ventures. 10gen originally aimed to build a platform as a service architecture based entirely on open source components; however, the company was unable to find an existing database platform that met their "principles" for a cloud architecture. As a result, the company began to develop a document-oriented database system it called MongoDB. After realizing the potential of the software on its own, 10gen's team decided to scrap its cloud platform and focus on maintaining MongoDB instead. In February 2009, 10gen released MongoDB as an open source project. 10gen opened its first west coast office in August 2010, having offices in Palo Alto, Reston, London, Dublin, Barcelona, and Sydney by 2012. In September 2012, 10gen was named as the top[clarification needed] software company and number 9 overall on The Wall Street Journal's The Next Big Thing 2012. In April 2013, 10gen moved into the old New York Times building. Office was located at Prince St. before. On August 27, 2013, 10gen announced that it would change its name to MongoDB Inc., associating itself more closely with what ultimately became its flagship products. On August 5, 2014, Dev Ittycheria was appointed as President and Chief Executive Officer. MongoDB Inc's primary technology product is the open source, NoSQL database MongoDB. MongoDB Inc. employs most of the developers of MongoDB. As of July 2018, the MongoDB database has been downloaded 40 million times. In 2016, MongoDB Inc launched MongoDB Atlas, a fully managed database as a service offering. Atlas is available in over 50 regions on Amazon Web Services, Microsoft Azure, and Google Cloud Platform. It contains features such as global clusters, automated provisioning and upgrades, backup and restore, and monitoring. Stitch Mobile Sync - sync server-side data with data in MongoDB Mobile on a device. 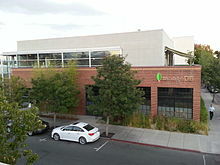 In March 2010, MongoDB announced that it would offer commercial support for MongoDB. MongoDB's subscription offering includes access to MongoDB Enterprise, professional support, and commercial licensing. With MongoDB 2.4 release, MongoDB introduced MongoDB Enterprise as part of its subscription offering. MongoDB Enterprise contains monitoring and security features such as kerberos authentication and role-based privileges. Cloud Manager is a cloud based solution for managing MongoDB. Cloud Manager automates provisioning on AWS, or through an automation agent installed by the user. MongoDB Compass allows you to quickly visualize the structure of data in your database, and perform ad hoc queries – all with zero knowledge of MongoDB's query language. The MongoDB Connector for BI allows you to use your BI tool of choice to visualize, discover, and report against MongoDB data using standard SQL queries. MongoDB World  is an annual developer conference hosted by MongoDB, Inc. Started in 2014, MongoDB World provides a multi-day opportunity for communities and experts in MongoDB to network, learn from peers, research upcoming trends and interesting use cases, and hear about new releases and developments from MongoDB, Inc. Major participants include developers, operators, CIOs and CTOs. In September 2012, the company announced a partnership with EdX to offer free MongoDB training online. There were 47,000 enrollments in the first MongoDB online education courses in 2012. As of June 2018, there has been 1,000,000 course registrations with MongoDB University. In addition to online education, MongoDB University offers public training classes as well as on-site training. MongoDB Inc., then known as 10gen, has received funding from the U.S. Government through the CIA-sponsored venture capital arm In-Q-Tel. This has been a source of concern in India. ^ "MongoDB Inc. Appoints Dev Ittycheria as President and CEO". Retrieved 7 September 2014. ^ MongoDB, Inc. | CrunchBase Profile. Crunchbase.com. Retrieved on 2013-09-18. ^ Harris, Derrick (May 29, 2012). "With $42M more, 10gen wants to take MongoDB mainstream". GigaOm. ^ Metz, Cade (May 25, 2011). "MongoDB daddy: My baby beats Google BigTable". The Register. ^ a b "10gen embraces what it created, becomes MongoDB Inc". Gigaom. Retrieved 27 August 2013. ^ Get in Touch | MongoDB. 10gen.com. Retrieved on 2013-09-18. ^ "Stacy Ferranti on Twitter". Twitter. Retrieved 2016-04-13. ^ "10gen Announces Company Results" (Press release). MongoDB. January 28, 2013. ^ "MongoDB University Passes 1 Million Registrations". MongoDB. July 12, 2018. ^ Joseph, Lison (Dec 3, 2013). "MongoDB startup hired by Aadhaar got funds from CIA VC arm". The Economic Times.